"On a hot Saturday afternoon I arrived at Madame Gautier cookery school to learn how to cook Filet de Boeuf En Croûte. 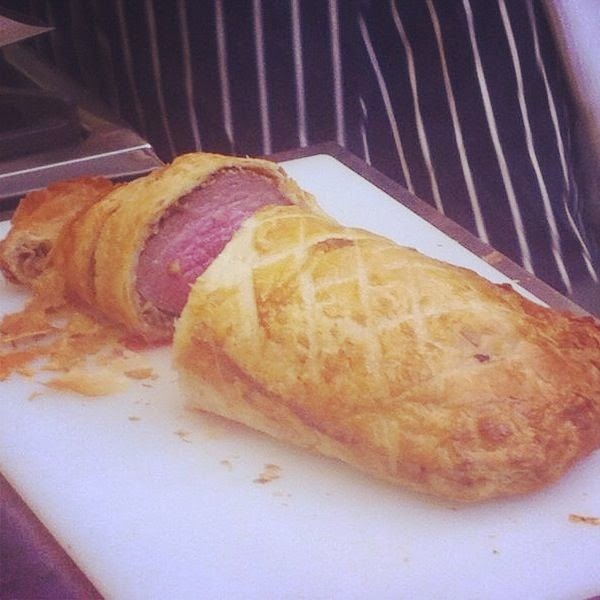 (Or beef wellington to you non-foodies). 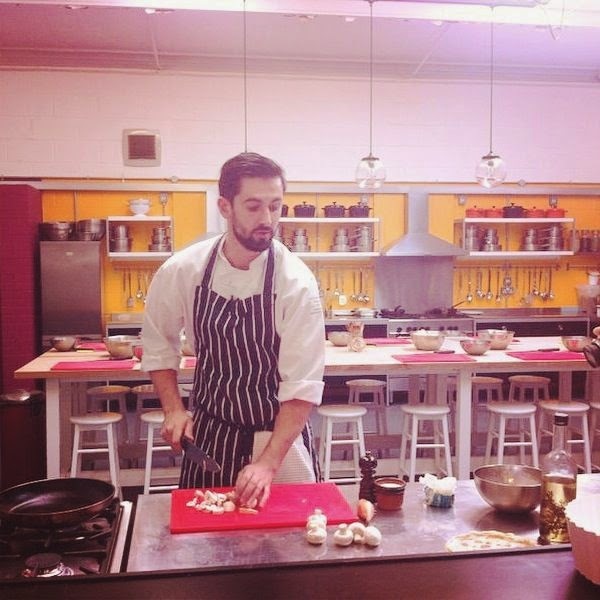 Our lovely teacher Adam began with a demonstration, showing us firstly how to cook the mushrooms with shallots and thyme (seriously the most amazing mushrooms I have ever eaten), then prepare and seal the beef and finally demonstrating how to wrap it up in puff pastry. Then it was down to us to attempt our own; cue lots of questions asked and answered with plenty of patience by Adam. "I learnt so much in this class including my favourite tip on chopping onions without tears; leave the root on until the last minute and breathe in through the mouth and out through the nose. I only started eating meat last year after a number of years as a veggie and have never cooked beef before. The class gave me so much confidence in handling and cooking beef, which was an added bonus for me. And we all got a taste of Adam’s demo dish, which was delicious. "We took away our dishes to bake at home – this resulted in me carefully carrying it home on the tube, nursing it like a small child. It made it home in one piece and was baked and eaten the following night… it was damn tasty and earned me some brownie points from the boyfriend!" If you would like to attempt to make your own, here’s the recipe. Start by rubbing oil, salt and pepper onto the steak, then fry the fillet in a dry pan until it has caramelised and has a deep rich brown outside. Remove the steak from the pan and place to one side to allow to cool. In the same pan, fry the finely diced onion, thyme and garlic for 1-2 minutes until the onion has softened. Add the mustard and cook for a further couple of minutes. Remove the onion and garlic from the pan, add a little oil and turn the heat up before add in the mushrooms. Fry the mushrooms in small batches, so that they fry quickly and caramelise, rather than stewing and leaking all of their water into the pan. Once the mushrooms are cooked, introduce the onions back to the pan and mix together until even. Put all of the mix into a food processor and blend until smooth enough to spread. If you like, you can add a splash of cream to help. To make the pancakes, crack the two eggs into a jug with the milk and whisk until combined. Add the herbs and salt to the flour. Slowly pour the milk and eggs on to the flour, whisking continuously until a smooth batter. Pass the mix through a sieve to remove any lumps. Once all of the components have cooled, you can start to build the Wellington. 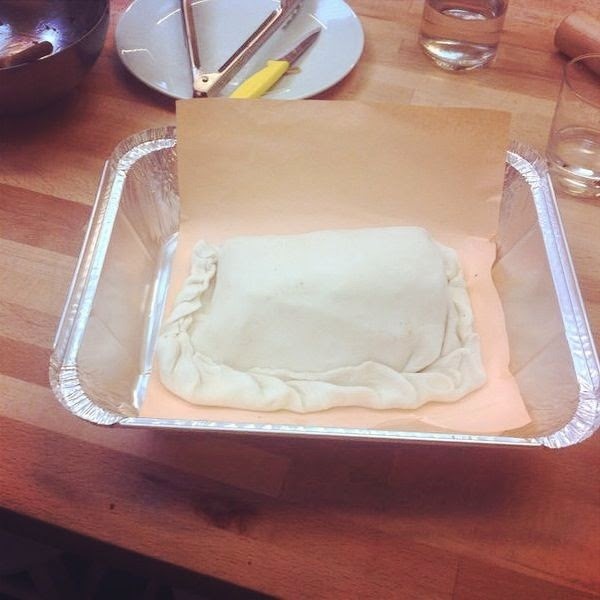 Roll out the pastry, until it is roughly the thickness of a pound coin. Lay the pancakes out, so that there is enough surface area to fully coat the beef. Spread the mushroom duxelle over the pancakes before topping with the beef. Finally, roll the pancakes and pastry around the beef, before sealing the pastry at the bottom, and trimming away any excess pastry. When you are ready to cook, egg wash completely and place in the middle shelf of a pre-heated oven at 220C for 35-40 minutes. The longer it is cooked, the more well done the beef will be. For a medium cook, 35 minutes should be sufficient; however this does vary from oven to oven. Once cooked, remove from the oven and allow to rest for 5 minutes before serving.